And you thought Metallic Friday was over… wrong again! After seeing King Kong last night (alright movie, not awful-not great), I nearly froze on the walk back to the car. And I figured that chances were when I woke up in the morning there would still be no sun- and that just made me angry. Nevertheless, I woke up to grey cold skies. So if you are reading this, I have a message for you Sun. Dear Sun: If I left you behind in Florida by accident, don’t be mad at me and please please come up north for a little bit. But either way, I am continuing with shiny bags for today also. It seems that in today’s world none of us can live without cell phones. In fact, if any of you can- I’d love to hear about it! Mine broke for 2 days and I nearly just cried (ok you got me- I might have shed a tear or two ;-) ). But if you want to protect your phone with something stylish, why not do it with some Prada? 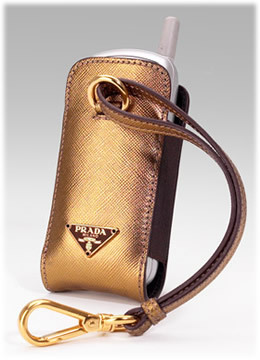 The Prada Cell Phone Case is made from saffiano gold leather and measures 4″H X 2″L X Ã‚Â¾”W. Too bad Prada doesn’t tell us exatly which phones fit in there, but I guess we could all figure it out the hard way by measuring our phones. Availabe in black and orange also, you can buy this protector through Saks for $190.